This condition where the collar bone has been separated from the shoulder blade is commonly known as an acromio clavicular dislocation. In many countries in the world however, this condition is also known as a shoulder separation. In short this means that the joint between the shoulder blade and collar bone has been disrupted, due to an injury and that the stability at this joint has been lost. This usually happens during a fall directly onto the shoulder joint, where the shoulder is pushed downwards and the collar bone dislocates upwards. When one looks at these patients with these dislocations, it seems as if the collar bone has gone up into the air, in fact the shoulder blade has gone downwards and it is a false impression that the collar bone has now been elevated upwards. These dislocations are classified in 6 types, depending on the severity of the injury. Type 1 – this is an injury to the joint, but there is no separation between the bony elements, therefore it can’t be seen as a deformity when looking at the patient and it’s also not seen on the X-ray. On examining the patient, however, there is tenderness over the joint. Inside the joint is a small cartilage, like in the knee joint and this is usually torn and is the cause of the pain. These Type 1 injuries might end with ongoing problems with pain in the joint, due to this injury to the cartilage. This condition usually ends with surgery, although initially it might look innocent. Type 2 – this injury involves the stability of the joint and there is a separation between the collar bone and the shoulder blade. This is mild however, and the joint is not really grossly unstable. There is also still continuity between the collar bone and the coracoid process, which is part of the shoulder blade and thus prevent a major separation at this joint. This injury can also be treated conservatively initially, but because of the minuscule injury in the joint, might come to a surgical procedure later on. Type 3 – this injury involves a disruption of the ligaments connecting the collar bone to the shoulder blade as well as the ligaments connecting the collar bone to the coracoids process. These are usually unstable and is clearly seen when looking at the shoulder, with the shoulder blade hanging down and the collar bone pointing upwards. As there is no contact between the shoulder blade and the collar bone, they usually become painless, although the patient is left with the deformity and is usually treated conservatively. Type 4 -5-6 can be grouped together, as they are severe injuries, where there is major disruption of the joint, with the collar bone penetrating either to the downward side or to the backward side or to the upward side, into the muscle surrounding the joint with a major deformity and a bad functional outcome. Therefore the group 4-5-6 are usually operated. These injuries are the ones that usually look mild initially, as there is no clear separation at the joint present and they usually settle within a couple of weeks. There is however the meniscus inside the joint that might be torn during this injury and these injuries can cause ongoing problems on the long term. Many of these cases will end being operated with a removal of the far-end of the collar bone and the meniscus to relieve pain. This can be done with arthroscopic surgery (keyhole surgery) and is a relatively easy procedure to be done. 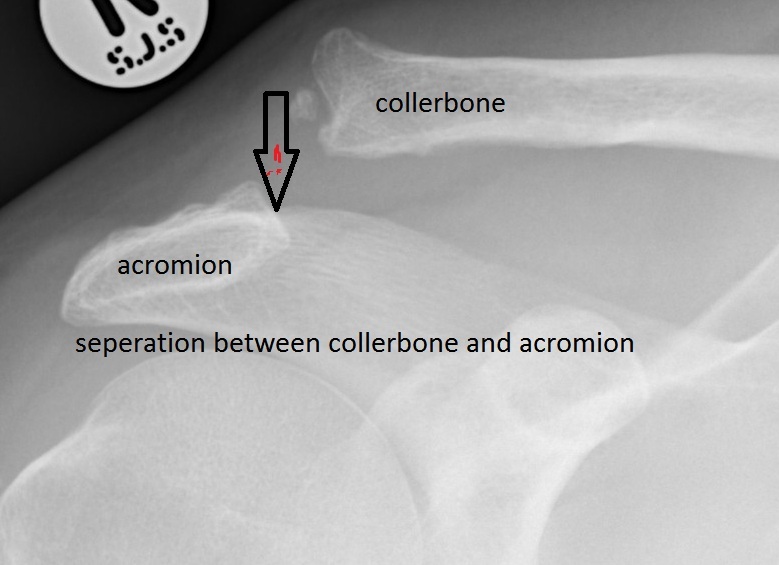 This is the injury where there is separation between the collar bone and the shoulder blade, with deformity. As there is no contact between the bones, they usually become pain free, because the torn meniscus is not compressed between the bony ends. These can usually be treated conservatively if the patient is prepared to accept the cosmetic deformity, with the shoulder hanging down and the collar bone pointing upwards. One should keep in mind that if you decide to treat this for the cosmetic deformity, you will end with a scar on the shoulder and you either have the scar or the cosmetic deformity. As mentioned before, these dislocations are severe and are either complicated by the collar bone pushing downwards, backwards or to the top into the muscle surrounding the muscle joint. These cannot be treated non-operatively and they are usually operated with a reconstruction of the joint between the collar bone and the shoulder blade, as well as a reconstruction of the ligaments between the collar bone and the coracoid process. The choice between operative and non-operative treatment in these cases should be discussed with your managing doctor, as there is some controversy regarding this matter. The Type 1 and 2 can certainly be treated conservatively initially, and should it become painful later on, a procedure can be done to remove the end of the collar bone and the meniscus. Therefore surgery is not usually advised in these cases. In the Type 3 case the cosmetic deformity can definitely justify a surgical procedure, although one might have to keep in mind that these Type 3 dislocations usually become pain free and if the patient can accept the cosmetic deformity, can be treated conservatively. Although these deformities might look gross, many of them are uncomplicated and people can return to high level sport with these injuries. Should a surgical procedure be done, one might have to keep in mind that you will have scar tissue over the shoulder joint. This might be prominent, especially in female patients when wearing un-sleeved dresses. In some cases one might have late symptoms from this dislocation, as the arm hangs down and pulls on the brachial plexus (the nerves that run to the arm) and might cause neurological symptoms to the arm, like “tingling” in the fingers, swelling of the fingers and lameness of the fore-arm. In these cases a reconstruction is also indicated. Type 4+5+6 are usually indicated for surgery, as it is already complicated by the severe deformity with the collar bone entrapped into the surrounding soft tissue on the shoulder. If one decides to treat these injuries conservatively, we would usually advise a period of rest, usually between 2 – 3 weeks for the Type 1 and 2 injuries, and up to 6 – 8 weeks for the Type 3 injuries. During this period of time, the treatment will consist of physiotherapy, to relieve pain, ice therapy, anti-inflammatory medication and pain relieving medication. Usually this will settle spontaneously by itself over this period of time and no further treatment is necessary. There are two schools of surgical treatment regarding this joint. This is a procedure where the operation is done through keyhole surgery, using a video camera and a closed technique, in other words the skin is not being cut open with a long incision, to gain access to the area to be operated. During this arthroscopic surgery procedure, the far end of the collar bone is usually removed and a reconstruction is performed between the shoulder blade and the coracoids process. 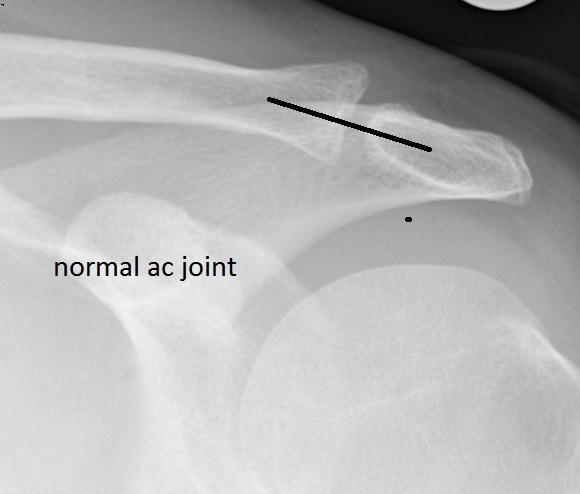 Also the ligaments between the distal end of the collar bone and the acromion is reconstructed. The arthroscopic technique is surgically demanding and should only be attempted by surgeons who has a lot of experience with the arthroscopic technique. The only advantage from the arthroscopic technique is the fact that there is no scar tissue and the patient is only left with a puncture wounds for passing the arthroscope and the instruments. Open surgery is performed for this cases and is still the golden standard for stabilising this joint. It is not technically as demanding as the arthroscopic technique and the only disadvantage is the skin scar that is being left. During this operation, again the end of the collar bone can either be excised or left. If the distal end of the collar bone is left, at least the meniscus should be excised from the joint. Thereafter the ligaments are reconstructed between the collar bone and the coracoids process, as well as a reconstruction between the collar bone and the acromion. The exact surgical treatment will differ between an acute case, in other words a fresh case and an old long standing case. In the fresh cases, the ligament reconstruction is not really necessary as the injured ligaments will heal by themselves and form a new ligament to stabilise the dislocation. As long as the collar bone can be kept in place until the ligaments heal. The collar bone can be kept in place by either tying it down with stitching material or using a screw from the collar bone to the coracoids process for temporary stabilisation. Alternatively, a hook plate can be inserted from the collar bone to the acromion, to keep the collar bone down until healing has taken place. First complications and problems of the hook plate, using this link. If it is a chronic injury, where the immediate healing cannot take place any more, the ligaments will have to be reconstructed; usually tissue is then harvested from the patient’s thigh or from the fore-arm, to be used for the reconstruction. Alternatively, ligaments can also be ordered from the body bank. The advantage of this is that the patient does not need the pain and injury from the harvested area. The patient will need shoulder rehabilitation exercises with the physiotherapeutic department for a careful rehabilitation to physical activities. In general the shoulder is usually immobilised, until the pain has subsided (10 – 14 days). After this the general movement are started within the pain limitations of the joint. The shoulder should be protected for at least 6 weeks to physical activity, as these reconstructed ligaments might be dislodged from their attachment areas. The shoulder is usually protected up to 3 months for physical contact sport.